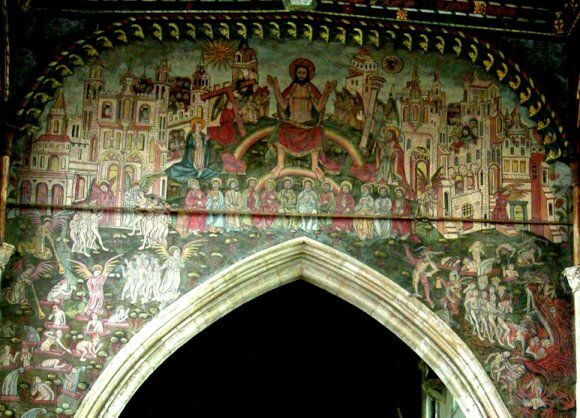 English churches have a distinctive tradition of Last Judgment scenes, known as 'dooms'. They frequently appeared on the chancel arch, so were always in view of the congregation. Of course, the Reformation zealots did not approve of such things, and these images were plastered over. Ironically, this was an aid to their survival. From Victorian times onwards the plaster began to be scraped off and the images were revealed, though sometimes the subsequent restoration left a great deal to be desired. 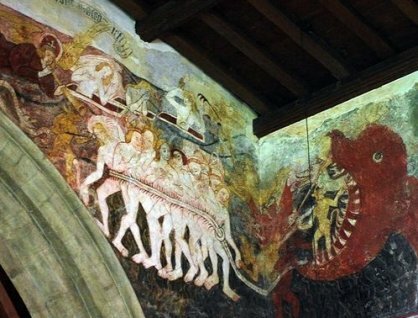 Below is the doom of the Church of St Thomas, Salisbury, Wiltshire. The rector's stall is on the side of the damned, which provides some amusement to the congregation. On to St James the Less, South Leigh, Oxfordshire. 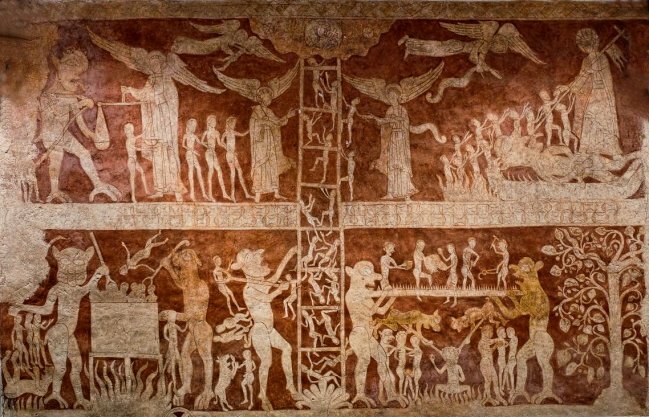 Below is perhaps the most extraordinary Wall painting in any English church. This scene, know as 'The Ladder of Salvation', is one that is relatively familiar in Byzantine art - but this is Surrey! 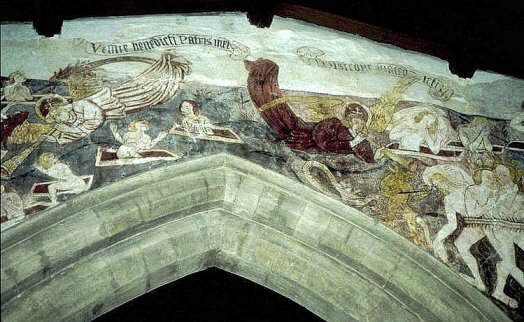 The church of St Peter and St Paul in Chaldon contains this 12th century painting. In the lower half, sinners, represented by the seven deadly sins, are being tormented by devils. In the centre is that ladder; some souls are managing to climb it, others not. At the top left St Michael is weighing souls: at the left Satan lies bound, while an angel ushers the saved towards Christ who stand on the Devil and thrusts his staff into his mouth. It is impossible to do justice to this extraordinary image here: for a fuller account, visit the Painted Church website.